Once I actually “saw” forgiveness. With my own eyes. In person! 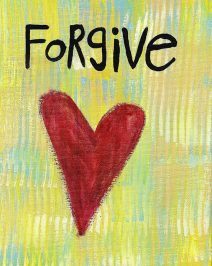 Most of us have experienced forgiveness one way or another, given it or received it. Been a witness to someone else giving it or receiving it. Learned about it, studied about it, struggled with it. I am going to tell you about the time I saw forgiveness. It was amazing! Margie was about 45 years old when I met her. She was a member of one of the first Restoring Your Heart groups I led. It was a group of about 6 women who met together for a couple of hours once a week to go through a workbook and share emotional hurts from the past. The object is to understand our past, grieve our losses and heal. Usually, during the three months of meeting together, the women grow very close to one another. Margie’s group was no exception. A little history on Margie. Margie grew up in a really strict home. Her parents were cold and stoic, and as we went through the lessons together Margie told of how they frequently called her stupid or ugly when she was a child. She was neither, by the way. When we started the group sessions, Margie had an enormous amount of animosity towards her ex-husband. The lessons in the workbook are focused on childhood but Margie had a hard time staying with her childhood issues. She wanted to vent about her ex-husband at every session. About a third of the way through the workbook, Margie realized we were aiming towards forgiving those who had hurt us. She became very agitated and announced that there was one person she could never, ever, ever, ever forgive…her ex-husband. Fast forward to pretty close to the end of our workbook, past the forgiveness part. Margie walked into the group session one night and she looked radiant, seriously glowing. She was happy and excited. She looked like a different person. When Margie acknowledged her pain and grieved her loss, she was able, with the power of the Holy Spirit, to forgive. It not only changed the way she felt, it literally changed the way she looked. That was the night I actually “saw” forgiveness. If Margie’s story has encouraged you or perhaps touched a nerve in you, and you would like to see and experience the healing power of forgiveness in your own life, learn more about the WDA Restoring Your Heart Ministry at www.disciplebuilding.org.